Russian artists Reutoff and Sal Solaris have both made a decent musical career of things thus far, both producing relevant releases for their chosen genres. Here they come together for a split release covering the principles of reality (Sal Solaris), and pleasure (Reutoff); referring to the psychoanalytic concept of inner human life. You’ve got to give a tip of the hat to some people for the effort in not only dwelling on such concepts, let alone acting on them musically. Sal Solaris are up first, with a spangling array of harmonies, offset with a low-end scattering fuzz of ambient textures. ‘Navigare Est Necesse’ eventually filters these harmonics out into the open where they’re picked apart with an array of rhythms and sample styled vocals with earthly pads; only to succumb to the ghostly apparitions of ‘Essay on Reality of Science Studies’, providing a submarine effect of pressure electronics that filter through to great effect. Surprisingly, Sal Solaris weave their way in from a more electronic stance than one would expect, where most exponents of the genre rely on more traditional analogue sounds; either way, it works. Reutoff approach their work in much the same fashion, albeit from more of a traditional angle. Relying mainly on the more harmonised side of pad work they bring an evidently more ethereal element to the proceedings; and one which compliments the release as whole in conjunction with their partner in crime for this album. As a whole this album is thoroughly enjoyable from start to finish, with my favour lying ultimately on the soundtrack approach of Reutoff who captivates and drags the listener to another more beautiful space. This is by no means knocking Sal Solaris, as it just sits better with my personal tastes; and the quality is set to an equally high standard on both counts. 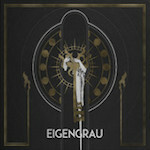 Set in a lavish foil embossed digipak, ‘Eigengrau’, whilst not being a world-beater is quality nonetheless.